Véhicule d'entraînement, quatre roue. pour un or deux poneys de 128cm ou moins. 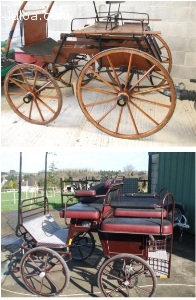 Four wheels 1890 varnished Dog Cart, for one or two 1,28cm ponies or even smaller + English leather harness for single or pair. Four wheels exercise vehicle - same purpose.